How do we practice Wise Effort and maintain Zeal? Vīrya (Sanskrit; Pāli: viriya) is a Buddhist term commonly translated as “energy”, “diligence”, “enthusiasm”, or “effort”. It can be defined as an attitude of gladly engaging in wholesome activities, and it functions to cause one to accomplish wholesome or virtuous actions. All beings without number I vow to liberate. Endless blind passions I vow to uproot. Dharma gates beyond measure I vow to pass through. 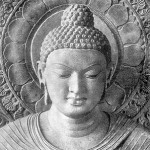 The great way of Buddha I vow to attain. EXERCISE: Splitting off in to small discussion groups, consider what it means to experience Viriya within the traditional three components: Armor (Development of Character & Courage), Virtue (Development through Ritual & Teachers), and Compassion (Development through Benefiting Others). Having been assigned a specific component, explore practical, pragmatic, constructive, or tangible actions we can take, or habits we can let go of, to generate Energy in our daily lives, especially in our spiritual and/or meditation practices. Be prepared to share your Best Answer(s) with the Sangha. This entry was posted in Home and tagged armor, bodhichitta, Compassion, discussion, Energy, Four Right Exertions, Viriya, virtue, Virya, vows, Wise Effort. Bookmark the permalink.